The National Green Tribunal (NGT) refused to lift the interim ban on mining in Meghalaya in a hearing on March 25. 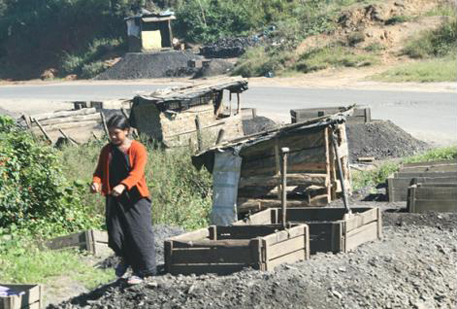 On April 17 last year, it had issued an interim order to stop rat-hole coal mining across Meghalaya. It had also warned against illegal transportation of the mineral. “No order for fresh mining was passed, and it will be decided only after the state mining plan is in place,” state government counsel Ranjan Mukherjee told the media. The tribunal, however, provided partial relief to coal miners by permitting them to pay royalty on the extracted coal within 21 days and allowed transportation of the mineral until May 31. Mining is the state’s highest revenue generator. Meghalaya Chief Minister Mukul Sangma told the Assembly on March 13 that the interim ban has resulted in a revenue loss of around Rs 600 crore in the current financial year. The state government has implemented a 20 per cent cut in non-plan expenditure and revised VAT on certain items, among other measures, to bridge the revenue deficit. Sangma said the Meghalaya Mines and Mineral Policy, 2012, was in conflict with the Mines and Mineral Development and Regulation (MMDR) Act, 1957 and Coal Mines Nationalisation Act, 1973. “While implementing the Meghalaya Mines and Mineral Policy, 2012, it has come to our notice that customary laws, rights and practices were in conflict with the provisions of Central laws governing mines and minerals,” said the chief minister. Sangma added that the NGT had asked the state to consult with the Centre before making final its coal mining plan. The state is now developing a framework for safe and scientific mining and has constituted a Task Force Committee to improve tax realisation. The ban has hit thousands of small traders. People like tea stall owners, who were dependent on people engaged in the coal trade, have been forced to shut shop. “Many have become jobless and livelihoods of thousands of people have been jeopardised. We are waiting to see whether the coal trade will be made operational or not,” said Chiang Shira, a coal trader in Meghalaya. People also claim that the loss of livelihood has resulted in an increase in criminal activities. “The ban has left thousands of people financially shattered. Equipment meant for the mines is being stolen and sold by thieves,” said Zinba N Sangma, a mine owner. Coal traders have asked the government to ensure that mining resumes in the state. “Hopefully, the government will work out the modalities and ensure we can restart the whole thing, keeping the environment in mind. The government has failed to provide any alternatives for many who are left without a source of income,” said Georgemon Marak, a coal trader. In February this year, Chief Minister Sangma had brought up the issue of the ban on coal mining at the first meeting of NITI Aayog.